Let's Learn About Robots With Recon 6.0 Programmable Rover! If you happen to include the type of people who are less interested in putting on all matters relating to the robot but you want the opportunity to Share Them along with your baby at home, Recon 6.0 Programmable Rover might be an alternative of your choice this time. Yeah, right, with the robot toys are cheap and fairly pleasant is reportedly able to make your son or daughter fell in love and interest will be robots. For most people may still consider the robot to learn about it is a matter that it is still very expensive. But remember one day robots will become an essential part of everyday life, then there is no harm in that knowledge and interest about the robot would need to be introduced as early as possible to your baby at home. And this is one of the best and brightest ideas, not! When viewed closely, the exterior may be okay to look less convincing because it looks like a jagged piece wheels are quite complicated. But who would have thought if it turns out Recon robot has an important role against the interests and knowledge your children will be robots. 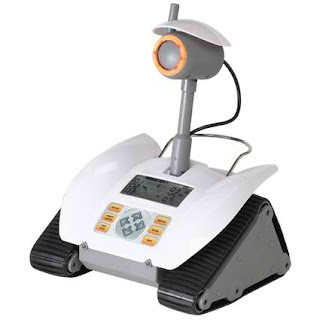 Recon robot is equipped with several control options are very user friendly, including some of the direction of the arrow and 10 buttons, as well as a built-in microphone and speakers. Some LEDs are also not spared added, allowing users to create their own mission by specifying different paths that will be followed by the robot as a guide. In addition to tu, Recon 6.0 Programmable Rover has also been equipped with an LCD screen and a metallic tool to handle the transport so that the robot can berbergerak here and there with more easily and freely. Given Recon 6.0 Programmable Rover has a size of 10.5 x 11.5 x 10.5 inches, then by itself will need a place large enough for the motion. Coupled with the support of three C-type batteries in it, making this a robot can be strong to survive for the activity. However, the manufacturer does not provide significant information related to the existing power pack. For those interested, a programmable robot Recon Rover 6.0 These may be regarded products are quite affordable. And the price per unit sold for 70 USD. Hm, you want him?